I'm a firm believer in spending time with family, friends, and a good decor book for the holidays. 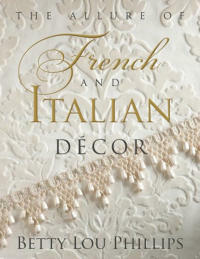 "The Allure of French and Italian Decor"
as a Christmas giveaway to one lucky reader! 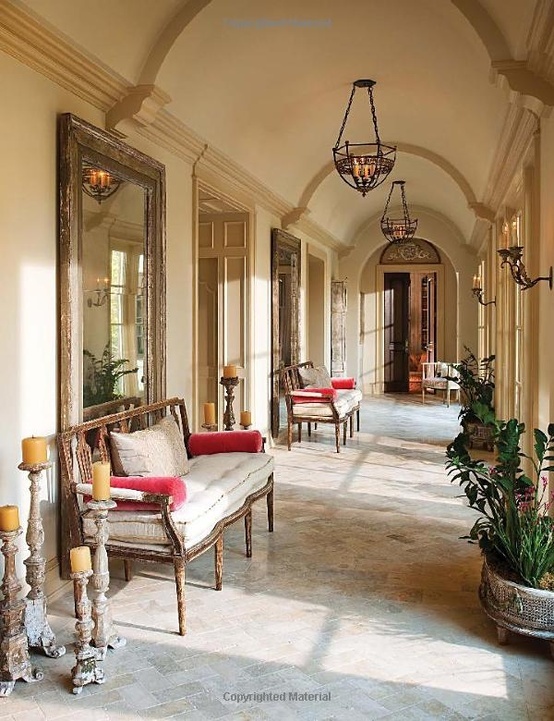 Acclaimed interior designer and author Betty Lou Phillips has brought together hundreds of beautiful design images in this large, coffee table book. I'm sure you'll spend lots of time pouring over the inspiring images, just as I did. 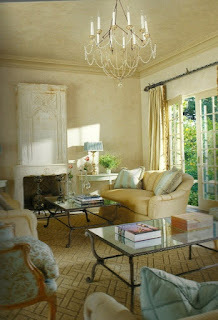 The pair of settees in this space made me drool. The silk velvet bolsters are to die for. 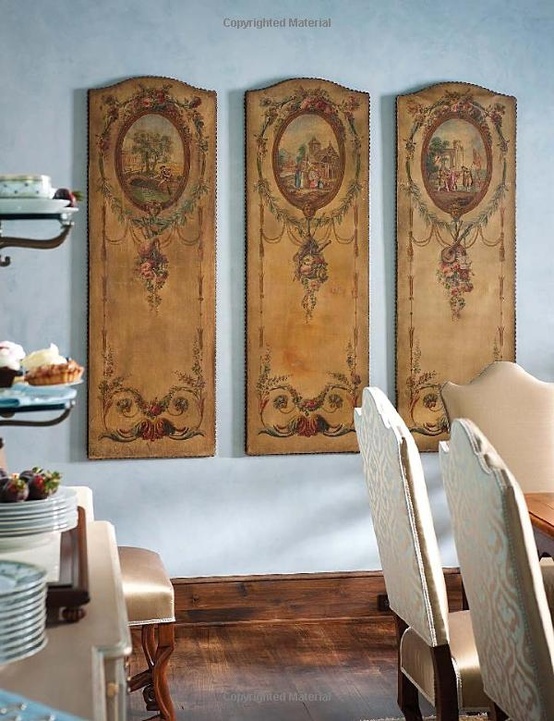 These french oil paintings on canvas kinda/sorta remind me of the antique french wallpaper panels that hang in my living room. "The Night Before Christmas in Paris"! of Mrs. Claus in Paris at Christmastime. For a chance to win both books leave a comment to this post. Anonymous comments are welcome; just make sure to leave your e-mail address in the comment. Comments will close on Friday, December 21 at noon EST and a winner will be drawn shortly thereafter. Good luck! And as always, thanks for visiting a perfect gray. Donna what a wonderful giveaway at this time of the year. Count me in please! Happy Holidays! Love her - I have 2 of her books and wouldn't mind adding a 3rd. Thanks for the chance to win. Two great books I'd love to have, thanks for the chance to win! These look fabulous! Happy holidays! I would love both books. What a great looking book - count me in for sure! What a fabulous giveaway! Would love the books! Merry Christmas and Happy New Year! I receive your emails everyday- I love your Blog and I would be so happy to Win the wonderful books. Hi, Donna - Would love to win :) Thanks for making it so easy, too! Ah, this looks so lovely! Both books would be a wonderful addition to my library of design books. thank you for the having such a wonderful giveaway!! Thanks for your beautiful blog and the lovely giveaway! Serene design pictures are how I de-stress! Happy Holidays and Merry XMas to you and your family! Toss my name in too! What a beautiful giveaway! Wow, sounds like a fantastic giveaway, thanks for the chance. What a treat to wake to A Perfect Gray every morning!! Would love to win! Thanks and have a wonderful holiday! A wonderful giveaway! Thank you, Donna! I hope you have a smashing holiday season Donna........hope we get to meet at Scott's in 2013!! What a great giveaway! Love your blog and look forward to more in 2013. Wow! The images you shared from Phillips' book are stunning! Fabulous giveaway! Have a wonderful holiday. What a very nice giveaway. Thank you for the opportunity. Happy Holidays. A perfect gray may be what I need for my dining room suite! How appreciative I would be to win the books! One of the best things about this year is your blog. I am loving all that you share with us. Your sense of style resonates with mine. Thank you for this fantastic Christmas giveaway! What a lovely give away! I would love to be the lucky winner! Thanks for the opportunity. Would love to win! I so enjoy your blog. Merry Christmas! Donna~ I would love to win! These books look lovely. Thank you for the opportunity to win, and a big thanks for your beautiful blog. French and Italian Decor is how we should all strive to have in our homes. thank you for this contest. I threaten to run away to Paris every Christmas. Perhaps this book will inspire me to do it at last! Best wishes for a happy holiday! What a lovely giveaway. Keep on Blogging. So elegant. Thanks for the chance to win! Merry Christmas! This would be wonderful to win!!! Merry Christmas! What beautiful books! Thanks! Hope your holidays are spent with those you love and the new year filled with wonder. Have a wonderfull Christmas and New Year - and thank you for playing Santa! Love your blog! Drooling over the blue prints, right now! You have a beautiful and fun blog. Thanks for sharing. This is one of my favorite blogs. I am also a big Betty Lou fan. Merry Christmas! Wonderful things here as always. happy holidays to you and thanks for the very sweet give away. love to win both books. Given how pricey these books can be, I do consider them a decadent indulgence! So fun to hang out and pour on one! 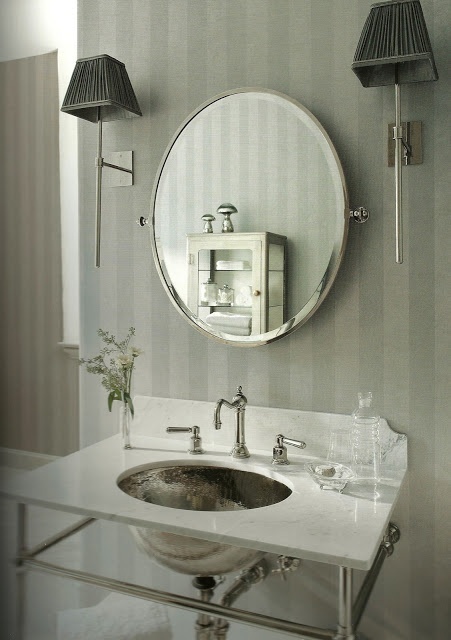 M.
Love the gray tonal stripes in that bathroom! I even like when the matte and shine of the same color is striped as well. So great! P.S. I would love the books too!! I love Betty Lou Phillips, have a couple of her other books.